INTRODUCTION: Adolescents with physical disabilities are prone to experience lowered self-esteem which can result in negative consequences for the individual as well as the community. It has been found that dancing may have positive emotional, social and developmental consequences. AIM: The aim of this study was to determine the influence of wheelchair dancing on the self-esteem of adolescents with physical disabilities. METHODS: Twenty-four participants were involved in this quantitative study. A before-and-after experimental study design was used which included a control group. Structured interviews were conducted to obtain information from the participants. The experimental group participated in wheelchair dancing, while the control group did not. RESULTS: A difference between the two groups was observed with 72.7% of the intervention group displaying an increase in self-esteem, compared to 54.6% of the control group. Improved self-esteem manifested in, for example, an improvement in eye contact and sense of responsibility. CONCLUSION: The researchers concluded that wheelchair dancing may have a positive influence on the self-esteem of adolescents with physical disabilities. Low self-esteem is commonly associated with adolescence1 and this increases if the adolescent has a physical disability2. Formulating a definition of self-esteem has been found to be difficult. According to the Oxford dictionary3, the term self-esteem is defined as 'high regard for oneself/ good opinion of oneself.' It can also be defined as 'intrinsic value, self-respect, self-reference, self-worth'4. It is, however, a difficult concept and a challenge to formulate a concrete definition. Lopez and Snyder5 have rather divided self-esteem into three sub-types, namely performance, social and physical self-esteem5. Reports in the literature indicate that a person's strengths and weaknesses are determined by self-esteem6-8. According to Brandon9, self-esteem is the perception that one is able to handle everyday demands and has a right to be happy. Individuals' interpretation of their abilities within different social environments and their confidence, based on the knowledge that they can make noticeable changes, also contribute to self-esteem7. Certain advantages are associated with having a high self-esteem, such as being able to manage the stressors of daily life and being happy. However, it was found that individuals with a low self-esteem might get involved in disruptive or criminal activities that could negatively impact on their local community, for example, substance use, violence, poor school performance, crime and teenage pregnancy5. Bylsma10 identified aspects of a lowered self esteem that could influence a child's development and ability to learn. These include: (i) the child often saying that a task is too difficult and that it cannot be completed; (ii) the child is uncooperative in tasks and can display explosive emotions; (iii) he/she does not make eye contact during conversation; (iv) he/she gives up easily even in the presence of small challenges; (v) he/she will avoid participation in various environmental tasks considered too difficult; (vi) the child dislikes making selections; and (viii) may form an absence of self-assurance10. Many adolescents attending a special school (school for learners who need additional levels of support)11 for children with physical disabilities in a large city in the Free State Province, were found to present with a lowered self-esteem as the first four of the above-mentioned aspects were observed by the researchers in the adolescents involved in the study. The limited duration of the research period did not permit the formation of a long-term relationship with the adolescents and therefore it was not possible to comment on the last three aspects (engaging in challenging activities, dislike making decisions, and confidence). Harter, Hirsch and Du Bois found that between 33% and 50% of adolescents experienced problems with a decreased self-esteem12. Possible causes of decreased self-esteem include changes in interpersonal relationships, puberty, male/female gender role definition and deciding on a career1. Furthermore, children with physical disabilities are prone to develop decreased self-esteem2. To adolescents, dance as an extramural activity might have value with regard to the channelling of energy and improving socialisa-tion13. Demo and Savin-Williams14 found that the social activities in which children participated greatly influenced their self-esteem. Therefore, as socialisation contributes to self-esteem and dance provides the opportunity to improve socialisation, dance could be considered as an important factor in developing self-esteem, especially in adolescents with disabilities. African culture also emphasises dance, as it is regarded as an important way of communication15. However, urbanisation and the Western culture have impacted on traditional African music and dance in such a way that it is performed much less, and new traditions have emerged with a combination of African and Western elements12. In southern Africa, these elements include music from swing and jive13. Thus a jive dance was incorporated into the study. Occupation includes pastimes which satisfy a person's needs16,17. This is a very critical component of a controversial subject in Occupational Therapy16. The three criteria for pastimes emphasised in the literature are explained as performance (noticeable part of the pastime), sense of being and development16. Dance, therefore, can be viewed as an occupation. Kielhofner18 stated that an occupation is an exceptional and effective method by which individuals can be enhanced. In the educational setting, the occupational therapist should be primarily concerned with a learner's ability to engage in meaningful activities16. Wheelchair dancing may be considered a meaningful activity and is appropriate for adolescents with physical disabilities15,18. South Africa's Sports Association for Physically Disabled (SASAPD) recognises wheelchair dancing as a sport which is presented in most provinces of South Africa19. Wheelchair dancing can be performed as combi-dance, which is a combination of one wheelchair user and one non-wheelchair user; duo-dance, when both participants are wheelchair users; group dance, which involves wheelchair and non-wheelchair users; and single dance, which is performed by an individual wheelchair user20,21. Wheelchair dances are divided into two main groups, namely ballroom and Latin-American. Ballroom dancing includes the waltz, tango, Viennese waltz, slow foxtrot and the quickstep, while Latin-American dancing includes the samba, cha-cha-cha, rumba, paso doble and jive20. An individual participating in wheelchair dancing may experience physical and psychological benefits, which include improved balance, flexibility, coordination, range of motion and respiratory control20. Social interaction and relationship development may also occur, whilst it also allows individuals to experience enjoyment should they dance socially. Furthermore, for those who dance competitively, it allows experience of and engagement in fair play, sportsmanship and interpersonal skills22. The aim of the study was to determine whether wheelchair dancing would have an effect on the self-esteem of the adolescents with physical disabilities. A quantitative research study was done, making use of a before-and-after experimental study design and a control group23,24. Approval for the study was obtained from the Ethics Committee of the Faculty of Health Sciences, University of the Free State, Bloemfontein, South Africa (Ethics no. 13/09). Permission was also obtained from all relevant authorities. Participating individuals in both the experimental and control groups gave informed consent to take part in the study. The special school where the research was conducted accommodates 250 learners with physical disabilities such as cerebral palsy, osteogenesis imperfecta and spina bifida. The academic programme consists of a mainstream curriculum and a Learners Support Section (LSS) for learners who are unable to participate in the mainstream curriculum and are in Grade 4-6. These classes are presented in English. The LSS programme focuses on the practical use of numeracy, literacy and life skills. On completion, children from both the mainstream curriculum who were unable to achieve grade 9 and the LSS group who qualify for the vocational class for job preparation, may attend the LLS class for a year. Learners of all cultural and ethnic groups are permitted to attend the special school although the representative ethnic groups at present in the school are Afrikaans, Sesotho, isiXhosa, isiZulu and Setswana (see Table 1). In collaboration with an occupational therapist working at the special school, 43 potential participants for the main study were identified based on inclusion criteria such as age (13-17 years), the physical ability to move and control his/her own wheelchair or to maintain his/her balance at a moderate walking pace that would enable them to dance with a person in a wheelchair, and being able to verbally participate in a structured interview that was held in English (the school's official language of instruction) in order to measure self-esteem. Learners who were previously involved in formal wheelchair dancing were excluded from the study as it could already have had an influence on their self-esteem. Blascovich and Tomaka stated that reliable self-esteem measurement tools are severely limited25, and none could be found by the researchers within the occupational therapy context. Therefore, other disciplines were consulted to find a measuring tool which could quantitatively determine the influence of the proposed intervention on the participants' self-esteem in this study. Although addressing self-esteem issues are integral to the occupational therapy context, little recorded evidence could be found of tried and trusted methods to assess or treat self-esteem. Available psychological questionnaires were studied and eventually the researchers selected the Janis-Field Feelings of Inadequacy Scale (JFS), which was regarded as the most applicable for this population, as the questions in this instrument assess multiple components of self-esteem5. These components include body image, socialisation, academic and extramural activities. The JFS has been used effectively in research in the field of psychology26,27. The questions and answering scale were adapted to make it more concrete to ensure understanding by the learners, simplify the language and make it more applicable to adolescents. The essence of the questions and answering scale was, however, maintained and all the adolescents were asked exactly the same questions. As a limited number of learners was available for the research, four learners who were suitable but did not meet the physical inclusion criteria were selected for the pilot study of the questionnaire which was carried out to evaluate the adaptations made and ensure appropriateness of formulation and language. The modified questionnaire consisted of 35 closed-ended questions answered by means of marking a 4-point Likert scale, where 1 (or A) represented "most of the time"/ "very sure", 2 (or B) represented "sometimes", 3 (or C) represented "once in a while" and 4 (or D) "never" / "not sure". To maintain inter-relater reliability and validity of the scale, firm guidelines were drawn up by all the researchers to ensure that all questions were asked and explained to participants in the same manner. For example, the guideline set up for the question "How often do you feel clumsy?" assisted the researchers in explaining the word 'clumsy' to the participants as meaning dropping things, falling over your own feet or bumping into things. The questionnaire required that participants read and write (mark) the necessary answers. As some of the participants' disabilities prevented them from reading the questions and/or marking the necessary answers, structured interviews were conducted with all the learners in order to facilitate the assessment of self-esteem. The seven researchers (final year OT students at the time) interviewed each learner individually. Learners were taken individually to a private room by the allocated researcher to ensure confidentiality; questions were asked by means of the structured interview and according to established guidelines. With regard to the post-testing, and in order to maintain inter-rater reliability, the same researcher interviewed the same learner (whom they interviewed in the pre-testing) using the same structured interview and established guidelines. Once the researcher had completed the interview with the respective learner, he/she was taken back to class/hostel/ playground and the next learner was fetched to be interviewed. The number of participants was determined by logistic restrictions, such as the size of the school hall that limited the number of participants who could dance simultaneously, and transport after the afternoon dance sessions. Twenty-four learners were thus included in the study - half of these learners were exposed to wheelchair dancing. The other half formed the control group who was not exposed to wheelchair dancing. After completion of the structured interviews, the answers were scored by the researchers. The scoring was double-checked by one of the other researchers and the participants' level of self-esteem was calculated by adding up their scores to a maximum of 35 and then divided by 35. The scores were attained by allocating a numerical value to the learner's choice of answer: 1/A = 1 point, 4/D = 4 points. Seven of the questions, however, had a reverse scoring, namely 1/A = 4 points, 4/D = 1 point. With the assistance of the Department of Biostatistics at the University of the Free State, Bloemfontein, the selected learners were divided into an experimental and a control group in order to account for external factors which might influence self-esteem. The experimental and control groups were matched to ensure that the two groups were comparable with regard to age, gender, and scores obtained on the self-esteem pre-test. During this process, two learners could not be matched and were excluded from the study. Each group consisted of six male and five female participants, of whom five male participants in each group were wheelchair users. The researchers attended a one-week course to acquire the necessary skills to present the dancing at the school. Twelve dance classes of one hour each were then given to the experimental group over a period of four weeks, which was the allocated time for execution of the study. The classes started with a group dance and then proceeded with teaching the learners more specific dances and refining their skill in these. During the classes, the participants were taught the slow foxtrot (combi-dance) and the jive (group dance) by demonstration. Initially, the dances were broken down into smaller parts: the basic movements were first learned, then the more complicated moves/actions (for example, the turns) and then finally the music was added. Other materials used during the research included appropriate music for each dance (according to the knowledge gained at the wheelchair dancing course attended) and wheelchairs borrowed from the special school (mostly for the researchers) to demonstrate the choreography of the dances. After completion of the intervention, each participant in the control and experimental groups was re-interviewed by the same researcher using the same questions as in the pre-test. Pre- and post-tests conducted by the researcher ensured that any changes in self-esteem would be evident by comparing the scores. Frequencies and percentages were calculated for categorical data, and 95% confidence intervals (CI) were calculated for differences between pre- and post-test values. The analysis was done by the Department of Biostatistics at the University. The premise was that should a statistically significant difference in self-esteem between the two groups be found, it would indicate the potential positive impact of the intervention24. In total, 22 learners with a median age of 15 years (range 13-17 years) participated in the study. Of the participants, 63.6% had a diagnosis of cerebral palsy. Six (27.3%) participants did not take part in any extramural activities, while the rest were involved in athletics, chess or table tennis. 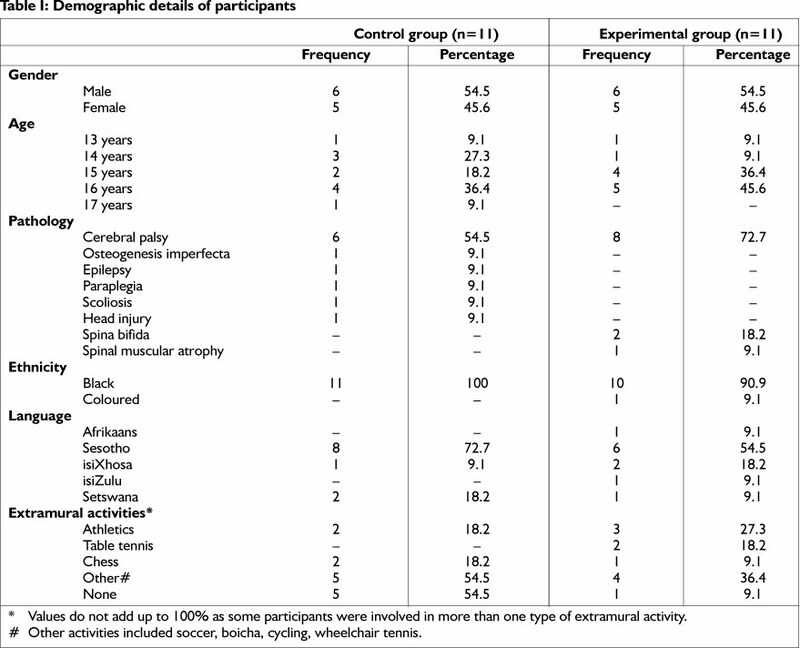 Table I summarises the demographic information of the participants included in the study. The mean scores of the pre- and post-JFS (the Feelings of Inadequacy Test) were calculated, and the difference between the pre- and post-tests was determined (Table 2). A negative value indicated a decrease in self-esteem and a positive value indicated an increase in self-esteem. In the control group, the self-esteem of six participants (54.6%) increased. Two participants' self-esteem was unchanged and three participants' self-esteem decreased. In the experimental group, 8 participants' (72.7%) self-esteem increased and 3 participants' (18.3%) decreased. The 95% CI of the median difference of the mean scores between the control and intervention group was calculated [95% CI -0.3 ; 0.7], indicating no statistically significant difference. However, a clinically significant difference was observed (see Discussion). The self-esteem of most of the participants in both the control (54.5%) and experimental (72.7%) groups was observed as having increased. The teachers confirmed an improvement in self-esteem as they reported that the majority of participants of the experimental group displayed more confidence within the school environment. This confidence was manifested through improved eye contact, class interaction and participation in class-related activities. The occupational therapist at the special school also experienced a positive change in participants' behaviour, which was evaluated by using the 7-point criteria6 referred to in the Introduction. In the control group, the self-esteem of six participants (54.6%) increased. The reason for the apparent increase in their self-esteem might have been due, in general, to being selected for participation in the research, as well as continued participation in both Activities of Daily Living (ADLs) and extramural activities. With regard to the experimental group, verbal and non-verbal acknowledgement received from the researchers, visitors and peers relating to the dancing, could also have had a positive impact on participants' self-esteem. A further influence could have been the Hawthorne effect, described by Roethlisberger as the alteration in participants' actions or answers as a result of being included in the study28. Three of the participants in the experimental group obtained decreased individual scores after the intervention provided. As a result of spending time with the experimental group during the dancing, a therapeutic relationship was established between the researchers and the participants during this time. Therefore, it is possible that they might have been more truthful in answering the questions during post-testing than in the pre-testing due to this relationship, and as such their self-esteem might have appeared to have decreased25. Apart from the restriction in the number of dance classes due to the limited time allocated for undergraduate research which could have left participants feeling inadequate about their abilities on the dance floor, motivation to participate in the classes might also have been a factor which negatively influenced the study. Personal interest in the activity presented could have influenced their motivation to participate as all activities do not have the same meaning and value for all individuals. A study done at Cornell University in collaboration with researchers at the University of Rochester and at the New York State Center for School Safety, reported that success in certain areas that are meaningful to the adolescent, is one of the essential factors in improving self-esteem. Another factor is obtaining approval from the people that they regard as important in their lives12. Both meaningful engagement and approval from significant peers are seemingly supported by the findings of the clinically significant difference noted in the results of this study. In addition to the participants experiencing a feeling of success in wheelchair dancing, they received realistic feedback from the researchers and their peers. Since the participants were not aware that their self-esteem was being measured, this could not have had an influence on the results. A possible limitation of the study was that the restriction in the number of participants could have influenced the statistical significance of the results. It is recommended that the researchers establish a therapeutic relationship prior to the pre-testing of self-esteem and that one researcher conducts all the structured interviews or that teachers be asked to conduct the structured interviews, as this will ensure that the learners are at ease in answering the questions and it will ensure uniformity in the way questions are asked. The intervention should include a larger number of participants and be conducted over a longer period of time, (e.g. a full school term) which will provide the opportunity for the participants to improve their adequacy in dancing and thus more likely to give a true reflection of the influence of dancing on their self-esteem. Since a measurement tool had to be utilised from the field of Psychology due to the absence of such a tool specific to occupational therapy, the researchers recommend that an appropriate measuring tool be developed within the Occupational Therapy field, as self-esteem has an important influence on the daily functioning of individuals10. We also propose that wheelchair dancing be implemented as an extramural activity at Special Schools for learners with physical disabilities. If the opportunity arises to improve an individual's self-esteem on a long-term basis, wheelchair dancing can be strongly recommended based on the clinically significant results observed. Finally, further research should be conducted on the effect of wheelchair dancing on other aspects, for example, perception and coordination. The difficulties experienced in this study (such as finding an appropriate measuring tool for self-esteem and time constraints for teaching a new activity) can be attributed to two main factors namely researching of activity and measuring self-esteem. Despite many challenges, we still found a clinically significant difference in the self-esteem results. We thus conclude that wheelchair dancing may have a positive influence on the self-esteem of adolescents with physical disabilities.